Just a year after the Erlend Apneseth Trio released their critically acclaimed debut album Det Andre Rommet, they recently returned with their sophomore album Åra, which was released on Hubro Music. Åra finds the talented triumvirate return with another album of original music that is regarded as an almost perfect improvised update of the post modern string trio. It’s led by twenty-seven year old Erlend Apneseth who is already regarded as one of Norway’s top young Hardanger fiddlers. Joining Erlend Apneseth in his Trio are drummer Øyvind Hegg-Lunde and guitarist Stephan Meidell. Together, the become the Erlend Apneseth Trio who switch seamlessly between musical genres and push musical boundaries to their limits, and sometimes, beyond on Åra. The result is another ambitious album of genre-melting music from the Erlend Apneseth Trio who are led by one of the pioneers of Norwegian music. Erlend Apneseth was born on the ’11th’ of August 1990, in Jølster, in Sogn og Fjordan, a county in Western Norway. It’s a small town with a population of just over 3,000 that is a popular destination for skiers. It was also where Erlend Apneseth first picked up the Hardanger fiddle and began a journey that would see him become an award-winning musician. That was still to come. Before that, Erlend Apneseth enrolled at the prestigious Ole Bull Akademiet in Voss, Norway, where he studied traditional Norwegian folk music. Erlend Apneseth’s turbo at the Ole Bull Akademiet was none other than Håkon Høgemo, another Hardanger fiddler who had already released a quartet of solo albums and featured on many other albums. He mentored Erlend Apneseth during his time at the Ole Bull Akademiet. By the time Erlend Apneseth graduated, he was ready to embark upon a musical career. The first many people heard of Erlend Apneseth was when he won Grappa’s New Artist Award in 2012. 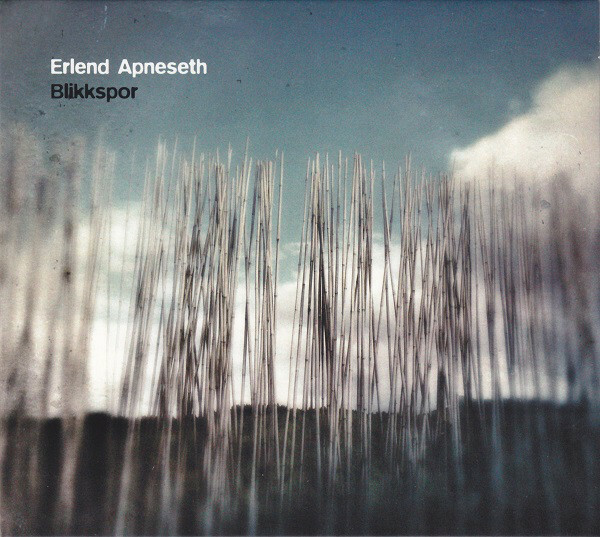 Buoyed by winning such a prestigious award, Erlend Apneseth began work on his debut album Blikkspor. Prior to the release of Erlend Apneseth’s debut album Blikkspor, he was one of five folk musicians under the age of twenty-five nominated for the Fureprisen award. This was one of the most prestigious prizes in Norwegian music, and one that came with a first prize of 50,000 Norwegian Kroner. At the award ceremony in June 2013, the five young, up-and-coming musicians waited to hear who had won the Fureprisen award. When the announcement came, Erlend Apneseth won the Fureprisen award and the first prize of 50,000 Norwegian Kroner. This augured well for the release of his debut album Blikkspor in October 2013. Blikkspor had been recorded at and mixed at Rainbow Studio during April and August 2013. The album was recorded with the help of a few of his musical friends, including trumpeter Arve Henriksen who also produced Blikkspor. When it came to record Sommarflukt, which closed Blikkspor, Erlend Apneseth brought onboard drummer Øyvind Hegg-Lunde and guitarist Stephan Meidell. They worked well together, but little did the three musicians realise that they would become part of one of the most exciting and innovative trios in the Norwegian music scene. Before that, Blikkspor was released by Hubro Music, in October 2013. Critical acclaimed accompanied the release of Blikkspor, which was described as an ambitious album of groundbreaking and genre-melting music that announced the arrival of innovative musician. It was also a tantalising taste of what Erlend Apneseth was capable of. Critics awaited his sophomore album with interest. Critics and record buyers had to be patient, as Erlend Apneseth was busy over the next couple of years. He found himself collaborating with musicians from a variety of different backgrounds, including folk, improv, jazz and rock. Groups big and small were joined by the Jølster born fiddler. So were folk singer Torgeir Vassvik and poet Erlend O. Nødtvedt. For Erlend Apneseth it was a case of have fiddle will travel, as he worked with a variety of different artists and bands. Erlend Apneseth even enjoyed a spell as a soloist with the Bergen Philharmonic Orchestra. Meanwhile, Erlend Apneseth was winning further awards that boosted his burgeoning CV. This included the Øivind Bergh Memorial Award and the Music Scholarship from Sparebanken Vest in 2014. The third award that Erlend Apneseth won in 2014 was the Ingerid, Synnøve and Elias Fegerstens Foundation For The Norwegian composers and Performing Musicians. Winning these three awards boosted Erlend Apneseth’s as his thoughts turned to recording a new album. 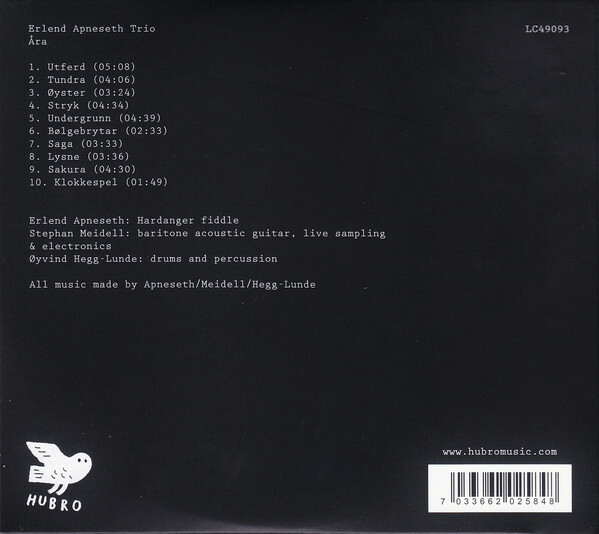 While Blikkspor was credited to Erlend Apneseth, his next album was credited to the Erlend Apneseth Trio. Its origins can be traced to the recording of Blikkspor, and when Erlend Apneseth brought drummer Øyvind Hegg-Lunde and guitarist Stephan Meidell onboard to feature on the album closer Sommarflukt. Erlend Apneseth hit it off with the two musicians, and asked them if they wanted to join him in a trio? They agreed, and that day, the Erlend Apneseth Trio was born. Since then, the Erlend Apneseth Trio had been playing live, and the supergroup was honing their sound. Having played together for the best part of two years, the Erlend Apneseth Trio still hadn’t recorded their debut album. That would soon change. 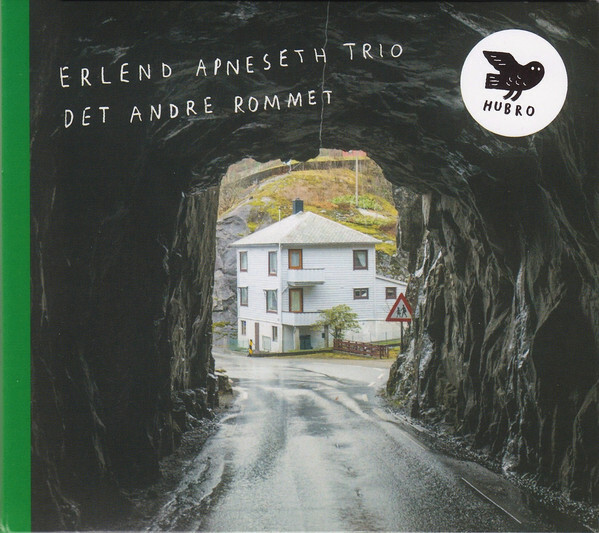 The Erlend Apneseth Trio recorded their debut album Det Andre Rommet at Hallibakken Lydproduksjon between the ‘9th’ and ‘12th’ if March 2015. A total of ten tracks were recorded and would become Det Andre Rommet. When Det Andre Rommet was released by Hubro Music in early July 2016, it was to widespread critical acclaim. The three musical mavericks had created an a groundbreaking and innovative album where they fused elements of avant-garde, improv, jazz, Musique Concrète and even rock. This resulted in an album that has the capacity to captivate as the Erlend Apneseth Trio spring surprises, as they take the listener in new and unexpected directions. Often, it’s Erlend Apneseth’s Hardanger fiddle that takes the listener on the emotional roller coaster that is Det Andre Rommet was. It was hailed one of the finest Norwegian albums at the end of 2016. By then, Erlend Apneseth’s thoughts had turned to his sophomore solo album. As 2017 dawned, Erlend Apneseth entered the Engfelt Forsgren Studio on the ‘5th’ of January 2017 to record his sophomore album Nattsongar. Just like his debut album Blikkspor, Erlend Apneseth brought onboard some of his musical friends. This included Stein Urheim, Ole Morten Vågan and Hans Hulbækmo. They were part of the band that spent the next three days recording eight of the nine tracks on Nattsongar, which was completed on the ‘7th’ of January 2017. 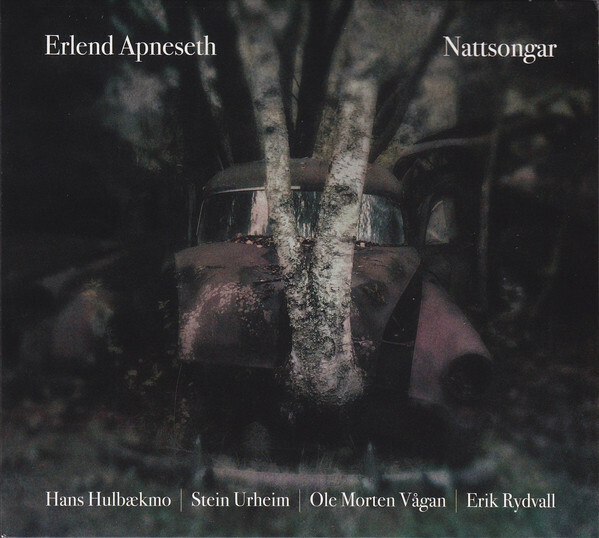 Three months later, Erlend Apneseth’s sophomore album Nattsongar was released to the same critical acclaim as his debut album Blikkspor. Just like Blikkspor, Nattsongar was hailed as an ambitious and innovative album from Erlend Apneseth when it was released on the Heilo label, an imprint of Grappa Musikkforlag AS which also owns Hubro Music. It would release the Erlend Apneseth Trio’s sophomore album Åra later in 2017. Just over a year after the release of their critically acclaimed debut album Det Andre Rommet, the Erlend Apneseth Trio make a welcome return with their sophomore album Åra. It features ten new tracks from the Erlend Apneseth Trio. For Åra, Erlend Apneseth wrote five of the tracks on Åra, including Utferd, Tundra, Undergrunn, Sakura and Klokkespel. Guitarist Stephan Meidell contributed Øyster, while Stryk and Bølgebrytar were written by the Erlend Apneseth Trio. Lysne was written by poet Erlend O. Nødtvedt, who also adds the vocal. The other track on the album is Saga which began life when the Erlend Apneseth Trio found an archive recording of an unknown musician playing a saw. This the Erlend Apneseth Trio decided to use as the basis for the track that became Saga. These ten tracks were recorded by the Erlend Apneseth Trio in early January 2017. Recording of Åra took place at Jørgen Træen’s Duper Studio in Bergen during January 2017. Drummer and percussionist Øyvind Hegg-Lunde provided the heartbeat while guitarist Stephan Meidell also took charge of sampling. Erlend Apneseth played Hardanger Fiddle and co-produced Åra with the Norwegian musician Andreas Meland whose responsible for the Hubro Music. When Åra was completed, all that remained was for the album to be mixed and mastered. Jørgen Træen mixed Åra at Lydgrotten Studio, Bergen, during May 2017. Then Helge Sten a.k.a. Deathprod mastered Åra at Audio Virus Lab, June 2017. Now Åra was ready for release. 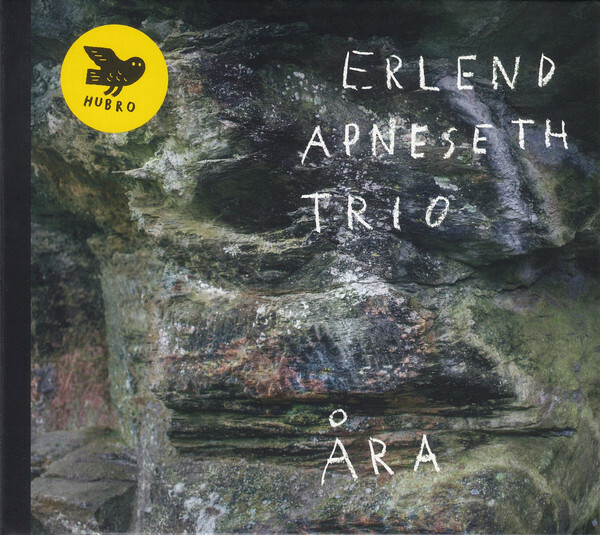 Four months later, and Åra was released by Hubro Music, and finds the Erlend Apneseth Trio. It’s an almost flawless improvised album, where the Erlend Apneseth Trio modernise the contemporary format of the post-modern string trio. It takes on new meaning on Åra, which has been compared to a Nordic retort to Tin Hat or Trio Taksim where the Erlend Apneseth Trio seamlessly switch between disparate musical genres on their second album of groundbreaking music. Opening Åra is Utferd, which gradually reveals its secrets. Initially, the soundscape is reminiscent of an orchestra as it tunes up. Soon, though,the unmistakable sound of the Hardanger Fiddle emerges from the soundscape and adds a rueful, wistful sound. It’s joined by urgent percussion and pitter patter drums. They become urgent as they propel the improvised arrangement along. By then, the Hardanger Fiddle wheeze and whines while distant percussion can be heard. Later, the soundscape becomes understated and melodic as calmness descends, after the captivating musical storm. Straight away, there’s an understated, minimalist and even an Eastern sound to Tundra as a plucked fiddle and washes of guitar combine with the rhythm section. It takes care not to overpower other instruments, as the Erlend Apneseth Trio carefully craft a ruminative, cinematic soundscape that meanders along, all the time painting pictures in the mind’s eye. The guitar on Øyster sounds as if it belongs on the soundtrack to a Wim Wenders’ film. It shimmers and glistens, while the Hardanger Fiddle quivers and then plays with a degree of urgency. Sometimes, it plays second fiddle to the guitar, while other times, they combine and create a moving and poignant backdrop. Meanwhile, drums and percussion are used sparingly, allowing the Hardanger Fiddle and guitar to take centre-stage. They create a track that sounds as if it belongs in the remake of a Spaghetti Western. Later, this moody, moving and poignant soundscape dissipates allowing time for reflection. Stryk features the Erlend Apneseth Trio at their inventive and innovative best. To create this soundscape they combine a droning fiddle and washes of guitar. Sometimes, the guitar threatens to feedback, but this never happens. Instead, it’s part of the Erlend Apneseth Trio’s carefully sculpted soundscape that veers between dark, eerie and chilling to moody and broody. Always though, the soundscape is cinematic and would be perfect soundtrack for a short film. Erlend Apneseth’s Hardanger Fiddle sets the scene on Undergrunn. Straight away, there’s a sense of sadness as it takes centre-stage and tugs at the heartstrings. Midway though the track, it’s all change as the drums create a raga backdrop. It locks down a groove and provides a contrast to the fiddle. Soon, washes of jagged, angular, improvised guitar are added. Later, it’s just subtle drums and a scratchy guitar that combine to create mesmeric backdrop, to what’s been a magical musical mystery tour. Bølgebrytar finds the Erlend Apneseth Trio let their imagination run riot as they combine instruments, found sounds and samples. They flit in and out this soundscape. This ranges from a plucked, chirping fiddle and jangling, shimmering guitar to the samples of traffic and lorry. These became part of another carefully constructed and imaginative soundtrack that seamlessly combines avant-garde, free jazz and Musique Concrète in such a way that it makes perfect musical sense. Saga features the sound of someone playing a saw. It produces an eerie, haunting sound. Adding to the sense of unease is the jangling bells and the jarring, screeching fiddle. As various instruments and found sounds are added, a dark, ominous sound emerges from the soundscape. Especially when the otherworldly haunting sound of the saw reappears. Adding the earlier sense of unease is the sound of something being sawn, and falling to the floor. This gives way to the muffled sound of bells ringing, against a crackly analogue backdrop. It’s part of the most chilling and atmospheric soundscape on Åra. In the distance, fingers fly up and down the fretboards on Lysne, and gradually, the music draws neared and starts to reveal its secrets. Reverb has been added as the guitar and plucked fiddle combine with drums. They usher in poet Erlend O. Nødtvedt’s impassioned soliloquy. Just like the rest of the arrangement, it gradually grows in power. Meanwhile, drums and percussion provide the heartbeat to this powerful and moving multicultural soundscape from the Erlend Apneseth Trio. Sakura has an understated introduction as the Erlend Apneseth Trio play within themselves. Pizzicato strings combine with drums and percussion while electronics crackles. Gradually, the soundscape starts to reveal its secrets. This includes drums and percussion which are played softly and join with an Eastern inspired fiddle, chirping, chiming guitar and the crackling electronics create musical fireworks Later, the fiddle becomes wistful as its plaintive cry provides what sounds like the soundtrack to a battle as the bell tolls, but for whom? Klokkespel closes the Erlend Apneseth Trio’s sophomore album Åra. As a guitar chimes, the wistful sound of Erlend Apneseth’s fiddle takes centre-stage. It plays a leading role in the sound and success of this beautiful heart-wrenching track that closes Åra. Just over a year after Erlend Apneseth’s modest supergroup released their critically acclaimed debut album Det Andre Rommet, the supremely talented and versatile Erlend Apneseth Trio return with their sophomore album Åra. It’s ambitious, innovative and genre-melting opus that surpasses the quality of Det Andre Rommet. That was never going to be easy, but the Erlend Apneseth Trio features three of Norway’s top musicians Erlend Apneseth, Øyvind Hegg-Lunde and Stephan Meidell. They continue to push musical boundaries to their limits and beyond by combining disparate musical genres. This includes elements of ambient, avant-garde, drone, experimental, free jazz, improv, jazz, Musique Concrète, Nordic Wave and rock. To this, the Erlend Apneseth Trio add found sounds, samples and Eastern sounds and guest artist Erlend O. Nødtvedt. When all this is combined the result is album of ten soundscapes that veer between abstract to atmospheric to broody and moody, to chilling, dark, eerie and otherworldly. Sometimes the music is beautiful, emotive and heart-wrenching, while other times it’s poignant and powerful. Sometimes, the music is thoughtful and ruminative and invites reflection. Often it’s cinematic as the Erlend Apneseth Trio paints pictures with their carefully crafted soundscapes. They’ve been created by master musicians who have dedicated their lives to the pursuit of musical perfection. The Erlend Apneseth Trio come tantalizingly close on Åra, which is another groundbreaking album of inventive and imaginative music from a pioneering group of like-minded musicians who reach new heights in their continuing pursuit of musical perfection. So much so, that in years to come Åra is will be remembered as a career-defining album from the Erlend Apneseth Trio and the album that future albums will be compared to.